Powers/Abilities: Super powerful. Able to see to greater distances than ordinary humans. Able to fly (which he did even when he didn't really need to). The bands of his wrists had a variety of powers, with each of the little balls having a different capability, from explosives, to a near invisible camera. The bands themselves could also fire energy bolts. History: Uri was given his powers by a secret Israeli scientific agency at the Israeli Negev. A former soldier, they used a special machine to grant these super powers to use against aliens which threatened the Earth. Comments: Created by Michael Netzer. The symbol on his chest represents a Jewish temple lamp. After appearing in four issues of his own magazine, he then turned up in Culunu, a children's magazine. Special thanks to Sam Moses for additional information. Sam worked with Michael Netzer on some of the issues of Uri On, and informs me "He has an arch nemesis, don't remember his name (Shimon, I think), he's an evil double agent. Sorry, it's been years. The original series ran for four issues before Mike and John ran out of money. 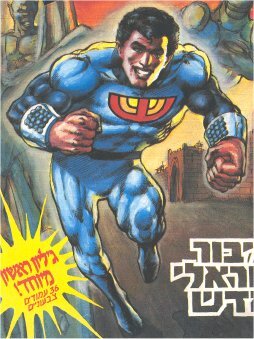 Superhero comics don't really sell all that well in Israel. The name Uri-Oan is an obvious illusion to Orion. Translated, it means "Strong Uri" or literally, "Uri of Strength" or "Uri of might!" or "Uri of Devine Power." You get the idea. Oan is one of those hebrew words that could be translated a couple different ways." He also named Uri Oan's girlfriend, clarified his powers, and mentioned that at one point, there had been the hopes of selling stories involving the character to DC as part of their Milestone comics.